Can’t get a babysitter to go to the gym? Don’t have room or storage for gym equipment? As a Mum myself, I understand all of these. I know you’re not making excuse to Keep Fit, you just need to find an alternative way. No matter what time of year it is, you can always decide to reach your fitness goals by doing a work out at home. I’m a busy Mum of 5 so I know how tough it can be to get to the gym. 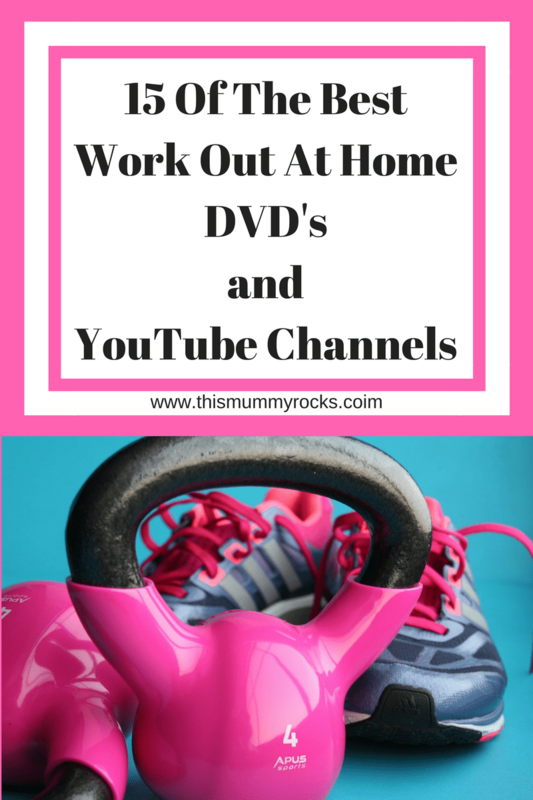 So I have put together 15 Of The Best Work Out At Home DVD’s and YouTube Channels. Why not try a workout at home? A work out at home are ideal for us parents. No matter if you are a stay at home mum or a working parent. A 10 minute daily work out at home could help you on your way to your fitness goals, in the luxury of your own home. You could do it between your childs naps, after the kids have gone to bed or even get the kids to do it with you! So I have researched and looked up the best workout DVD’s and YouTube channels that can give you that work out at home. There’s a little something for everyone here…. Coleen Mcloughlin: Brand New Body Workout….. why? Cos it looks like she actually has to work out in It! She’s sweaty, out of breath and it actually works! Results with Lucy is amazing, not only do they run online programmes but they have a massive online support community which is invaluable. Vicky’s 7 day slim dvd warm up and cool down so you build it up and only takes 30 minutes. I hope this has inspired you and has helped you find alternative ways to get fit and reach your goals! I’d love to here how you get on in your fitness journeys.